Shop area rugs online and the best Mughal Tings Motif Red Traditional Handknotted Rug at best price. It's time to provide something unique and luxurious item to your decor. 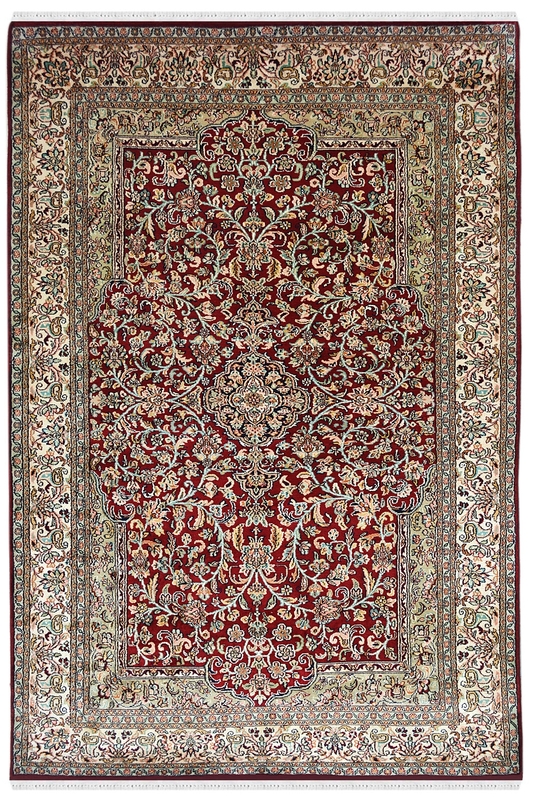 Buy this magnificent handknotted carpet which is woven silk on cotton and give a lavish look to a decor. It contains tiny floral motifs which have been inspired from nature. This is a silk on the cotton handmade carpet. When the supreme quality silk thread gets the touch of skill that is handed over through generations, the magic is born. This vibrant red color silk rug with fascinating Persian design easily catches anyoneﾒs attention. Surrounded by gracefully woven border this traditional silk rug is a true statement of your lavish lifestyle.